Torontonians feel the city should offer more help for new immigrants settling in the city, but aren't as keen on extending more benefits to religious minorities, results from Vote Compass suggest. Vote Compass helps voters see how their views stack up against the positions of candidates vying for Toronto's top job on council. So far, tens of thousands of people have answered a series of questions on the Vote Compass site on issues like taxes, transit, and law and order. Vote Compass is not a poll, but the data from respondents has been weighted to approximate a representative sample of Toronto's population. Half of a sample of 22,152 respondents who participated in Vote Compass between Sept. 28 and Oct. 22, said the city should do somewhat more or much more to help new immigrants adapt to life in Toronto. 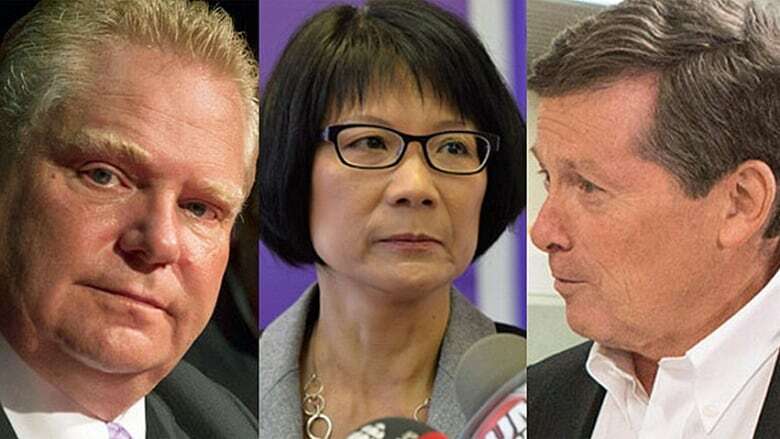 About seven out of 10 Olivia Chow supporters supported that notion, while only four out of 10 Doug Ford supporters felt similarly. John Tory's supporters and voters supporting candidates other than the top three contenders had similar numbers, with about five out of 10 agreeing. But respondents weren't as generous when it came to services for religious minorities. About half of those who answered questions on the Vote Compass answered "about the same as now" when asked how much should be done to accommodate religious minorities in the city. This sentiment was consistent between Chow and Tory supporters, and undecided voters. Ford's supporters were somewhat less enthused about accommodations for religious minorities. Voters were also asked about whether or not they believe the mayor should march in the Pride parade. Toronto's current mayor, Rob Ford, has come under fire during his four-year term for not marching in the parade. Slightly more than half of respondents said they somewhat agree or strongly agree that the city's mayor should always march in the Pride parade. However, half of those who identified as Doug Ford's supporters said they strongly disagreed with that statement. Another 17 per cent said they somewhat disagreed. Vox Pop Labs is an independent, non-partisan group of social researchers and data scientists that developed Vote Compass.